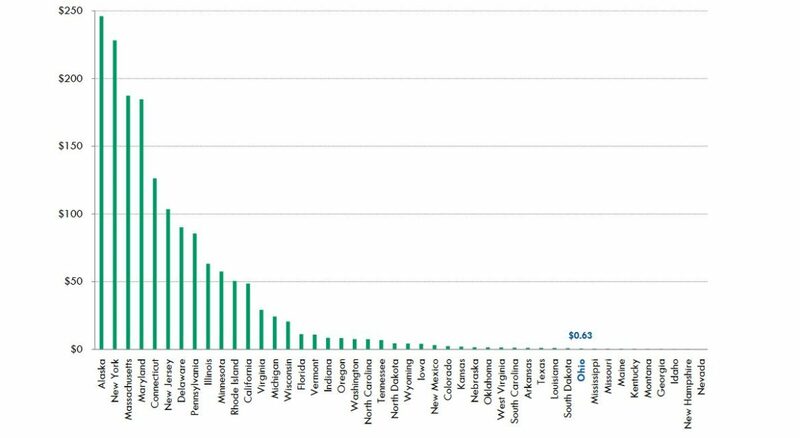 This chart, based on a 2014 report from the American Association of State Highway and Transportation Officials, shows Ohio ranks behind South Dakota and just ahead of Mississippi on per capita transit spending. While efforts to cut carbon emissions in Ohio have largely focused on phasing out coal-fired power plants, advocates say the state’s transportation sector shouldn’t be overlooked. Ohio’s per capita transportation emissions are comparable with other Midwest states. However, Woodrum said, “we do a terrible job at the state level of supporting public transportation,” which is regarded as a key solution to reducing emissions in the sector. A 2014 report by the American Association of State Highway and Transportation Officials found that Ohio spent only 63 cents per citizen on transit in 2012, compared to $8.57 in Indiana, $24.33 in Michigan, and $63.26 in Illinois. Among Midwest states, only Missouri ranked lower in the survey, at 50 cents per capita. Advocates fear that situation will get worse before it gets better. New research released last week by the Natural Resources Defense Council ranked Ohio among the top emitters for greenhouse gas emissions from transportation. Ohio placed sixth among the states in 2013 for carbon dioxide emissions from transportation, according to data released in October by the Energy Information Administration. The state ranks seventh in population. The breakdown among types of sources wasn’t readily available for the 59.9 million tons of carbon dioxide that Ohio’s transportation sector emitted in 2013. On a national basis, light-duty vehicles account for about two-fifths of greenhouse gas emissions, and heavy-duty vehicles account for roughly a fifth, Luke Tonachel at the NRDC reported. “Heavy duty vehicles are the energy hogs of the highway,” Tonachel said. In general, though, trucks are outnumbered by cars on the roads. The NRDC’s research found there is strong bipartisan support among Americans for measures that could cut carbon dioxide emissions from transportation, such as stricter fuel efficiency standards for cars and a requirement to consider climate change in area planning decisions. So far, however, Ohio’s planning has overwhelmingly favored automobile transportation over public transit. In 2013, 83.6 percent of Ohioans in the labor force drove alone to work, while just 1.7 percent took public transportation, according to data from the federal Department of Transportation. Even in Cleveland, which has the state’s most extensive public transit system, only 3.2 percent of workers commuted via public transit in 2014, NewGeography.com reported. Expanding public transit ridership would definitely help cut greenhouse gas emissions from transportation, said Kirt Conrad, president of the Ohio Public Transit Association. For starters, public transit cuts down on the number of cars on the roads. Public transportation systems in Ohio have been adding more vehicles that run on natural gas or propane, as well as some electric vehicles and even some few fuel cell vehicles, he added. However, adding riders is difficult when the state’s public transit system is underfunded, he said. Ohio’s public transit system will need $1.8 billion in investments by 2025, the Ohio Department of Transportation reported last year. That’s more than twice the 2012 investment of $893 million. After the report, Gov. John Kasich asked the legislature to budget an additional $1 million for public transit. The legislature rejected that proposal. Ohio and several other states are also under orders to change a current practice that charges sales tax on Medicaid managed care organizations. This will result in a lower sales tax base for both the state and for local governments that “piggyback” their own sales taxes on the state’s, Woodrum reported. As a result, public transit systems in the state could lose 6 to 7 percent of their funding, Conrad said. Meanwhile, Conrad noted, about 1,200 of Ohio’s 3,200 public transit vehicles are beyond their useful life and need replacement. “We’re definitely falling behind in our infrastructure,” he said. Only about 1 percent of the Ohio Department of Transportation’s budget goes for public transportation now, noted Ken Prendergast, the executive director of All Aboard Ohio. In his view, a “bare minimum” would be 9 percent. “Nine percent of Ohio households don’t have a car,” Prendergast said. For those people and many others, public transportation is essential so they can get to work, to the doctor or to school. “This is base economic participation for a lot of the riders,” Conrad noted. “Cars are expensive,” especially for low-income families, said Woodrum. Costs can be prohibitive for low-income people, as well as elderly people with disabilities. “This is way more than someone holding a Medicare card or a Medicaid card in their hand or someone on public assistance,” Shaner said. “We have a grey tsunami heading our way. The aging baby boomers are going to want and need public transportation. “Then there’s the trend of the younger generation looking for more vibrant communities” with convenient public transit, Woodrum noted. Instead, “we have entire neighborhoods that are disconnected from economic opportunity [because people] can’t get to a job” on public transit, she said. And 27 Ohio counties have no public transportation system at all. Meanwhile, population shifts to farther-out suburbs have further eroded the financial base for areas that do have public transit, Prendergast observed. Cleveland’s Regional Transit Authority already has a $7 million budget deficit and has recently announced service cuts and a fare increase.